Information security plays an increasingly crucial role in protecting the assets of an organization. As no single formula can ever guarantee 100% security, there is a need for a set of benchmarks or standards to help ensure an adequate level of security is attained, resources are used efficiently, and the best security practices are adopted. 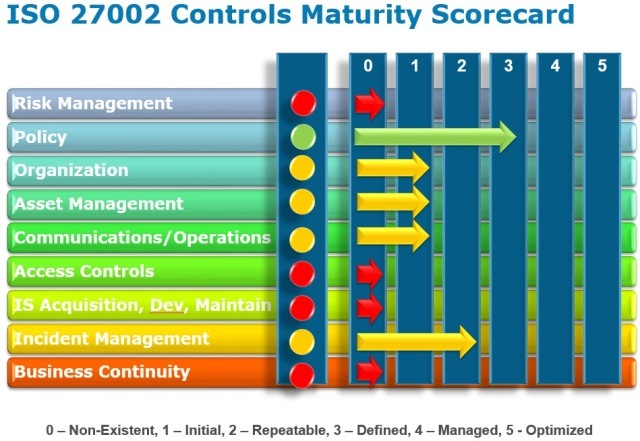 This blog illustrates a basic methodology to perform an ISO 27002 Security Benchmark and how to evolve towards compliance and become increasingly secure = integration with a Capability Maturity Model (CMM). ISO 27002 provides organizations with the assurance of knowing that they are protecting their information assets using criteria in harmonization with an internationally recognized standard. Benefits are applicable to organizations of all sizes and all security maturity levels, not only large enterprises. given the same strategic objectives. These top performers have custom-designed IT governance for their strategies. Leveraging internationally renowned security standards not only allows organizations to seek a reasonable goal of due-diligence but also enables them to articulate security posture to external partners and customers. ISO/IEC 27001, part of the growing ISO/IEC 27000 family of standards, is an Information Security Management System (ISMS) standard published in October 2005 by the International Organization for Standardization (ISO) and the International Electro-technical Commission (IEC). An Information Security Management System is a systematic approach to managing sensitive company information so that it remains secure. It encompasses people, processes and IT systems. 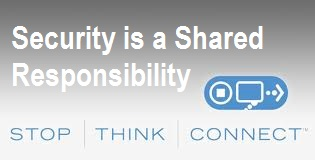 ISO/IEC 27002 is a Code of Practice for Information Security Management standard. It provides best practice recommendations on information security management for use by those responsible for initiating, implementing or maintaining information security management systems (ISMS). The Code of Practice establishes guidelines and general principles for initiating, implementing, maintaining, and improving information security management in an organization. These security domains contain control objectives with hundreds of best-practice information security control measures recommended for organizations to satisfy the control objectives and protect information assets against threats to confidentiality, integrity and availability. A Capability Maturity Model (CMM) is a model for judging the maturity of the processes of an organization and for identifying the key practices that are required to increase the maturity of these processes. The idea behind a Security CMM is to define areas of a security program that should have policy. procedures, processes and controls associated with them and then to measure the application and effectiveness of the policy. procedures, processes and controls (capability level) in an organization. A more mature organization is defined as one whose processes are better defined, integrated and managed. Such an organization is said to have a higher capability level than a less mature organization. The tool is used in interactive sessions with IT to discuss the various domains and controls of ISO 27002 and their current state in terms of development, implementation, integration and, maturity. The results are summarized in the checklist as well as the controls are validated to ensure accuracy. Once the exercise has been completed for all sections within ISO 27002 then the macros can be executed. They operate against a default template report in our case to auto-generate the report and enable an efficient and rapid benchmark. The deliverable report is then further developed with placeholder sections to customize and add expertise, industry trends and best-practices to management. An extract of the raw report is shown below. 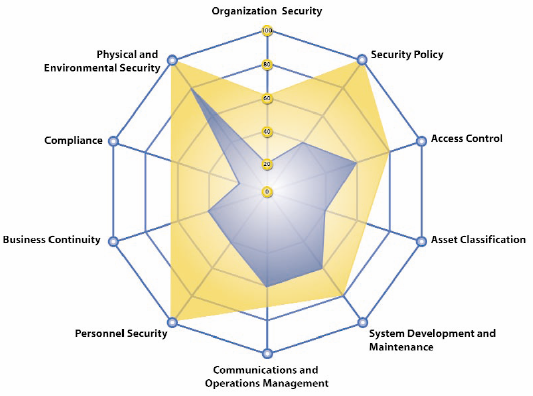 The tool additionally auto-generates ISO 27002 Security Benchmark Executive Summary slides that further enable presentation and visualization to executive management on current state as well as the organization’s objectives, enabling ongoing justification and support for the cost and resources needed for the security management and improvement program. The following is a sample of a high-level graph that maps compliance to organizational objectives and CMM. Once the organization has performed an initial Baseline Benchmark then the results can be evolved into an on-going lifecycle benchmark process and ISO 27002 compliance measurement program. Performing benchmarks quickly and efficiently reduces the burden and enables timely reporting on progress, depending upon organization’s size that is quarterly, bi-annually or, annually. It can be used to demonstrate progress and trends in what has been achieved and what is left to do. 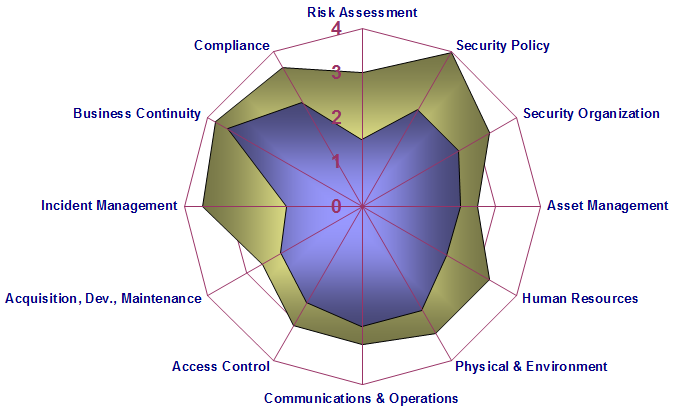 The following is a high-level example ISO 27002 Compliance Lifecycle. Implementation of a measurement system used to evaluate performance in information security management and feed back data for improvement. Management support is necessary at all levels. User awareness programs should also be conducted to ensure that all employees understand the benefits and impacts before the deployment of new security policies and guidelines. A common problem that crops up after implementation of a standards alignment exercise is an increase in the number of complaints received from users of IT services due to the restrictions imposed by new security controls. The successful implementation of any information security standards or controls must be a balance of security requirements, functional requirements and user requirements. Although there are a number of information security standards available, an organization can only benefit if those standards are implemented properly. Security is something that all parties should be involved in. Senior management, information security practitioners, IT professionals and users all have a role to play in securing the assets of an organization. The success of information security can only be achieved by full cooperation at all levels of an organization, both inside and outside. given the same strategic objectives”. It is an old quote that I re-used and forgot, thus no attribution but it looks as if it came from my book, IT Governance: How Top Performers Manage IT Decision Rights for Superior Results, Peter Weill, Jeanne Ross (Authors). Having this kind of benchmarking is very interesting. It is good to be used as a strategic tool based on Gap Analysis, but the restriction is that CMM is not internationally accepted method, since it is in US!! While CMM is not an international standard I propose it more as a best-practice and metric for compliance to the ISO 27002 standard. It is a useful planning and visualization tool to demonstrate to executive leadership where the program is, what the next steps are and, to seek ongoing support and financing. Hope this helps. The tool is basically an Excel spreadsheet with macros together with an MS Word template. They are useful and can contrast ISO to other compliance needs, such as PCI or HIPAA to take a holistic view. They are fairly easy to create and then you can use it both to track evolution towards compliance year over year as well as various visual summaries to seek budget/support based on next steps. Visualization. The following site has many tools and spreadsheets that you can use and/or customize, http://www.iso27001security.com/ and there are various other useful sources. What’s happening is that specific criteria through questionnaires are tied to several security controls frameworks. The NIST Cybersecurity Framework alone has three associated questionnaires–(1) DHS CRR, (2) DHS CSET (for Scada), and C2M2. The challenge for ISO\IEC 27001:2013 is that assessments are not standard (despite the reviewers guide) and are still fairly arbitrary based on who the accredited certification body is. At the Cloud Security Alliance, we worked hard marrying the Cloud Controls Matrix (CCM) to the Consensus Assessment Initiative Questionnaire (CAIQ), so that the grading criteria in the questionnaire aligned with the intention of the controls. I doubt this is done for the DHS CRR or CSET and know that this alignment is devoid in the ES-C2M2, ONG-C2M2, and core C2M@. By the way, we’re roughly using the same assessment approach. Here’s what I posted for the NIST CSF last October. I do tend to use ISO 27001/2 as a practical best-practice goal for many organizations, a minimum baseline on the road to more advanced security. 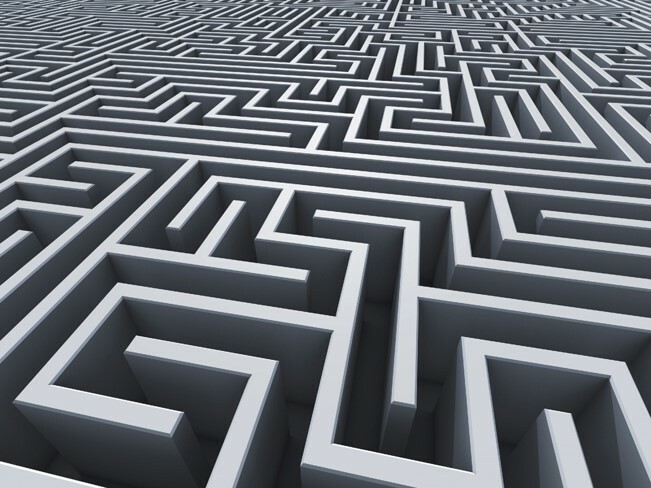 All regulations and standards tend to have grey areas open to interpretation, such as PCI DSS by the QSA. There is also a cost associated so you tend to discover many organizations are ISO certified in only certain domains or systems. The blog is already dated and, ideally, needs updating with my Master Compliance Framework. At great expense too many organizations seek regulatory compliance in silos and so the framework maps the various applicable regulations to enable coherent and holistic security requirements and compliance mapping. These frameworks and regulations have various breadth and depth so the organization needs to decide what framework works best and … what does it address, etc. It all comes back to … what are you trying to protect and need to protect and … the commitment of the organization to achieve compliance together with continuous improvement lifecycle.